Every single Eastleigh player that took to the pitch in this pulsating Hampshire Senior Cup tie has good reason to be proud of their efforts. The side were ultimately undone by a mix of extremely bad luck, baffling refereeing, and their own missed opportunities. In this performance however, there was huge hope for the future and no little encouragement for the present. 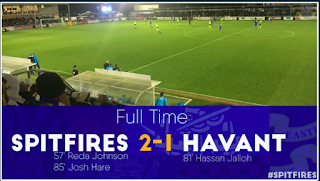 Richard Hill managed the occasion perfectly, treating the match with respect and ensuring important first-team players who need them got vital minutes into their legs, and placing fierce trust in a crop of the Spitfires’ talented youngsters. Of the eleven that started against Farnborough on Saturday; Jack Dovey, Mark Hughes, Michael Green (in the centre of midfield) and Craig McAllister were retained for this game played at New Milton’s Fawcett’s Fields ground. Charlie Basilone was handed a chance at right-back, while Lee Peacock showed his footballing ability by producing an assured 45 minutes at centre-half alongside the typically authoritative Andy Forbes. Adam Everitt began at left-back, with Dale Binns and Corey King filling the wide positions, and Lerone Plummer partnering McAllister up front. The opening five minutes offered no clue as to how the evening would unfold with a largely development Bournemouth side racing out of the blocks and passing the ball sharply and incisively. Once Eastleigh came to grips with the action and the filthy weather though, they quickly imposed their own fleet-footed style on the game. Corey King was regularly in the action. An indication of the dominance the ex-Macclesfield player would enjoy over his direct opponent came early. McAllister found him with a lovely swept ball out to the right which the youngster took in his stride, only to see his eventual cross put behind for a corner. On ten minutes King’s speed caused the hosts further trouble when a slide-rule Hughes pass inside the left back saw the winger fly past his marker, but again just fail to find the right final ball. Hughes became the first of the Eastleigh contingent to be booked shortly after for a slightly reckless tackle on Bournemouth’s dangerous wide-man, Lorenzo Davids. That left the ex-Barnet player to walk a tightrope for the remainder of the evening, but not once did he give the officious referee a chance to produce a second yellow in his direction. Hughes was superb for the second consecutive game, constantly cajoling younger team-mates and contributing any number of fine tackles and interceptions, all while maintaining his usual fine levels of distribution. The Spitfires were gradually looking the more likely of the two sides, but Bournemouth’s slick and aware football ensured they were always a threat, none more so than when a pinpoint delivery out to the left gave Josh Carmichael a chance to shoot. Fortunately, the Cherries’ midfielder struck well over. The visitors’ first strike on target was unsurprisingly provided by King, after Green had taken what was becoming a familiar route and fed the ball out to the livewire winger. King forced a fine save at his near post by Benjamin Buchel. Regardless of that stop, the ‘keeper was insecure when any ball was played into his area and confirmed suspicions of his vulnerability as he flapped unconvincingly at the resultant corner. Buchel displayed the same indecisiveness from the next flag-kick his side had to defend, which came after Green had seen a 25-yard free-kick deflected marginally past the post. Dovey’s first real piece of action came mid-way through the half when early Bournemouth substitute, the lively Anthony Harris, won a 50/50 challenge against Basilone leading to possession squirming out to Davids. The winger’s firmly hit low shot was comfortably saved by the Eastleigh stopper. Forbes was the next Spitfire to save his team when Peacock fractionally failed to get enough on a hopeful home forward ball, allowing Brandon Goodship to race clear. As the forward was shaping to shoot Forbes, in his usual stylish manner, perfectly timed his challenge as he slid in and took the ball off the Cherries’ number 11’s toe. Eastleigh’s best move of the first 45 minutes resulted in their nearly taking the lead. Some excellent interplay involving Binns, McAllister, and Hughes, preceded the ball arriving on the right at the feet of King. The winger drove to the byline and, lifting his head, spotted Binns advancing at the edge of the area. King delivered a precise pass back to his colleague who struck a screaming 18-yard effort which thumped against the bar and clear. The miss of the night, and perhaps the season, arrived shortly after. Goodship’s careful ball across the face of the Spitfires’ six-yard box presented Davids with an open goal, and plenty of time to finish. Unfortunately for the Bournemouth man, he somehow managed to scoop his left-foot shot from almost under the bar and high into the night. There remained time for one more fluid Eastleigh attack prior to the break. Hughes turned expertly in midfield, and played left to Binns. Further good work featuring Everitt and Green eventually led to the latter’s drilled left foot strike being blocked by Harris. When the teams emerged for the second-half, Green, who appeared to have received a knock had been replaced by DJ Whittaker, and Peacock by young left-back Brad Doyle. The second of those changes necessitated Everitt’s move into centre-half. If any Spitfire retained some doubt as to whether Everitt can contribute positively to this unit those misgivings must have been dispelled last night. The ex-Staines player was absolutely magnificent, and even allowing for King’s effervescent contribution was arguably his team’s best player. Everitt didn’t miss a tackle or waste a pass in 120 minutes. In addition, he galvanised and organised those around him, his leadership attributes prevalent throughout. As the second-period unfolded it was Cherries’ centre-back Joe Partington, a man with first-team experience, who saved his team with a last-gasp tackle as the hard running Plummer threatened to wriggle free after being released by King. As the half developed, King against his left-back was looking more and more like an unfair contest. The young defender was increasingly standing off the raiding wide player, terrified of being exposed, only for the Eastleigh player to torture his man with a sequence of tricks or old-fashioned raw pace. Just shy of the hour one such example saw King stop dead with the ball at his feet, seeming to tease the left-back, before exploding past him with a burst of pace which everybody could see coming but nobody could do anything to stop. King had the presence of mind to pick out McAllister whose low shot across goal was touched around the far post by Buchel. From the consequent dead ball Plummer rose impressively but couldn’t keep his header down. Nevertheless, the breakthrough was not long in coming. Everitt flicked on another corner from the left which the home team couldn’t clear convincingly. The ball ultimately landed at Hughes’ feet and the Northern Irishman struck an unerring volley across Buchel and into the right-corner. Just two minutes later the Spitfires nearly had a fortunate second when, after some fantastic McAllister hold-up play, King was free to cross from the right. The delivery was slightly mis-hit but struck the top of Buchel’s bar. With a little more than twenty minutes to play Ben Wilson replaced McAllister and the visitors switched to a 4-3-3 formation. Hughes, Whittaker, and Wilson formed a tight midfield triumvirate, with King, Plummer, and Binns combining as a flexible front three. 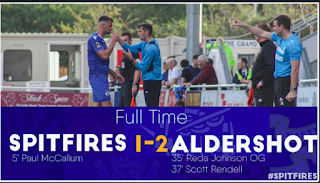 Eastleigh defended resolutely as the Cherries sought to step up their chase for an equaliser, Forbes stepping out on one occasion and sparking a swift counter-attack which finished with King supplying Plummer from the left. The forward ran onto the perfectly weighted pass but just couldn’t round Buchel and saw the ball squeezed behind. With ten minutes to play the hosts’ scored what, by that time, felt a thoroughly underserved equaliser. Baselle received a ball into his feet 20 yards from goal and immediately turned it into Goodship. The striker didn’t hesitate and rolled an impressively clinical finish beyond Dovey. Still Eastleigh didn’t sit back and with the clock running down Binns broke into the area and hit a fierce drive beyond the far post. As the final seconds ticked away time remained for plenty more drama. When Hughes played into King on the right, the winger found the terrific Whittaker’s forward run – the midfielder looked every inch a player ready for first team football in this encounter. Whittaker’s chipped cross was handled and, incredibly on the evidence of large parts of the night, the referee pointed to the spot. King sprinted to grab the ball, but hopes of a thrilling last minute winner were dashed when Buchel dived low to his left to save the penalty. As the ball was cleared to Harris on the left, Basilone came across with a sliding effort to win possession. The young right-back was late into the tackle but there was no hint of any maliciousness and the red card, brandished with a flourish by Mr Cook, was ill-deserved. Hopefully that moment won’t detract from what was a fine and confident display by Basilone. That incident led to another re-shuffle, with Whittaker moving to right-back – where he acquitted himself admirably – and Binns and King dropping back into a midfield four. Extra-Time was possibly destined on such a wet and windswept night but the ten men of Eastleigh were immense, giving no ground at all to their supposedly superior opponents in the additional period. Remarkably, minutes after the re-start the Spitfires restored their lead. Plummer did well to take possession from a pass on the left, and hold up with his back to goal. The alert young frontman laid a pass back into King who hit, first-time, a truly exceptional curling right-foot shot which drifted beyond Buchel and into the roof of the net. Bournemouth’s first real chance of the final 30 minutes fell to Clive Makoni, when his right-foot drive in the penalty area - after he was found by Josh Wakefield - slammed into Dovey’s left post. Everitt was soon booked after a driving run out of defence. The defender made an initial thundering and well-timed tackle, but was penalised for the follow up clash. Bassele was also yellow-carded for offering his opinion on the incident. Makoni had a further chance when he beat the advancing Dovey to a through ball but could only squeeze his effort wide. As the first spell of extra time concluded, Bournemouth were restricted to fruitless long range strikes in their attempts to find a second equaliser. The start of the second 15 minutes exemplified quite how frustrated the League One outfit were becoming as Makoni flew into a late tackle on Dovey for which he was rightly booked. Eastleigh’s defending continued to be exemplary with Everitt and Forbes both producing fine saving tackles in their own area, and Everitt providing another block. After Dovey had saved a shot at his near-post, Eastleigh were briefly hindered in their attempts to release pressure as King appeared to be labouring with a muscle injury. With five minutes to play the award of a free-kick for a clear foul on Binns brought a vociferous and boisterous reaction from a band of the travelling Spitfires’ support. That told of how rightly frustrated the visitors’ faithful was becoming with the man in the middle. Whittaker showed wonderful composure late on when under considerable pressure he calmly took a ball down and played a measured pass inside to Hughes. When the midfielder released Binns the attacker carried the ball free of danger and won a free-kick deep in opposition territory. It was from Binns’ attempts to again carry the ball wide and see out the final seconds that Bournemouth broke decisively at the death - this at a time when nobody in the ground could understand why the full-time whistle hadn’t already sounded. After retrieving possession Bournemouth broke swiftly and eventually forced a corner after Hughes had halted the move. The Cherries brought Buchel forward, and when the delivery was swung over from the left, the mop headed Harris flicked a header across goal which, almost in slow motion, drifted excruciatingly in at Dovey’s far post. The fevered manner of the Bournemouth celebrations told of what a lucky escape they knew they’d had against Richard Hill’s young outfit. The referee, of course, blew for time as soon as the Spitfires kicked off and we were left with the prospect of a penalty shoot-out to decide the outcome. After Hughes, Binns, and Everitt scored expertly for Eastleigh, and Partington, Bassele, and Wakefield had responded in kind for the hosts’, Buchel dived low to his right to keep out Forbes’ effort. Dovey just failed to match the Liechtenstein ‘keeper’s effort as Davids’ spot-kick sneaked in, before the Eastleigh stopper had his own penalty saved down to Buchel’s left. 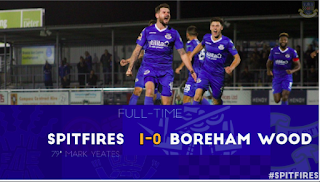 An astonishingly unlucky denouement then, but this was a night when all Spitfires’ followers could puff their chests out with pride in their team. Ultimately defeat in the Hampshire Cup is no long-term issue. It is to be hoped that the display by all in the yellow jersey on Tuesday night maintains the growing feel-good nature at the Silverlake.